Former New Jersey congressman Frank Guarini ’46 has pledged to donate $10 million to create foreign study opportunities in developing countries and underrepresented regions as well as expand “course-embedded” programs, the College announced on March 8. Course-embedded programs are academic courses taken on campus that involve an off-campus trip, typically after the course is completed. Guarini’s commitment adds to his $10 million gift to the Frank J. Guarini Institute for International Education in 2013 and another previous donation to fund the College’s Italian language study program in Rome in 2005. His 2013 gift helped the Guarini Institute launch more than 15 new off-campus programs over the past three years, according to Guarini Institute executive director John Tansey. Programs funded by Guarini’s donation include the African and African American studies foreign study program in Ghana, the exchange program with University College London and course embedded trips to countries such as China and Poland. Students taking embedded courses travel outside the United States to see the topics they have learned in the classroom in practice. In the 2016 winter interim, students in Anthropology 70, “Experiencing Human Origins and Evolution,” and Biology 70, “Biologic Lessons of the Eye,” went to South Africa and India, respectively. Students with heavy time commitments can find fitting a full-term program into their schedules difficult, so taking an embedded course is an optimal way for them to participate in an off-campus opportunity, Tansey said. He added that all course embedded trips will continue to take place in the winter interim. According to Tansey, the Guarini Institute has not yet determined the particular programs to which Guarini’s gift will be allocated. Gabriela Lowry ’18, who participated in the Spanish LSA+ program in Peru last fall and the biology FSP in the Caribbean and Costa Rica last winter, said that the gift money could be put toward helping students who do not have financial aid, particularly for airfare. “Oftentimes the flights themselves are really expensive, so help with that would be really good,” Lowry said. The announcement of Guarini’s pledge comes at a time when the Guarini Institute received a record number of applications, according to Tansey, which were due Feb. 1. The Guarini Institute received applications from 1,309 students for off-campus programs taking place in the 2017-2018 academic year, an increase from 1,010 students last year and 1,262 people the year before. Tansey said that the Guarini Institute usually receives a large number of applications to programs involving economics and government, the College’s two most popular majors since at least 2004, according to the Office of Institutional Research. Tansey added that other programs such as the English FSP in Ireland and the anthropology FSP in New Zealand also have a large applicant pool because there is high student interest relative to the low number of off-campus opportunities offered by those departments. According to Tansey, the Guarini Institute is exploring different strategies to attract more students to the programs it offers. He said that the Guarini Institute has worked with a student advisory group comprised of off-campus program participants to improve its programming and outreach this year, such as holding workshops on how to complete applications for programs. The Guarini Institute also started an annual photo contest, in which students can submit a photo from their off-campus program to be used for promotional materials and potentially win $100. 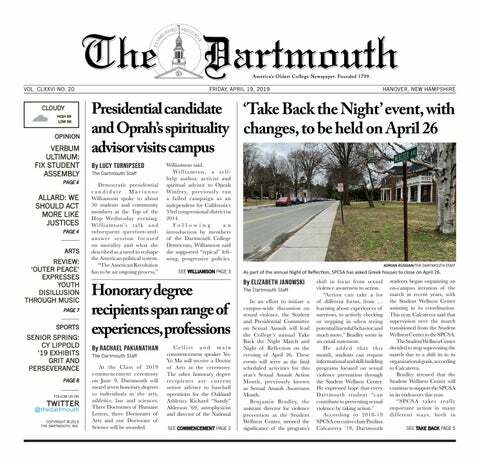 Students accepted to off-campus programs for the 2017-2018 year said that they are looking forward to studying in environments different from that of Dartmouth. Soomin Kim ’20 , who will participate in the music FSP in Vienna. Austria next spring said that as a classical singer, she wanted to learn from professional singers in Vienna, which she said she considers the “city of music.” Kim is a member of the Glee Club and the Christian a cappella group X.ado. Sara Cho ’20 said that she is participating in the FSP in Beijing, China as a prospective Chinese minor, but the chance to travel along the Silk Road, which she said is a once in a lifetime opportunity, mostly encouraged her to apply to the program.